Similar to other religions such as Judaism and Christianity, prophethood is an important concept in Islam. If the unity of Allah (tawheed) constitutes the ideological foundation of Islam, the concept of man’s khilafah, or vicegerency, provides the operational framework for understanding the Islamic view of the creation of human beings and their purpose. The story of Adam and Eve is found in most religious and major cultural traditions. The way the Quran narrates this event is crucial to the understanding of the Islamic worldview. The main outline of the Quranic narration is as follows: Allah declared His intention to send a khalifah, or vicegerent, to the earth. He created Adam and Eve from the same substance. They were destined to play this role of vicegerency and were endowed with the “knowledge of the things” to do the job well. Then they were put to a test and asked not to approach a certain tree. They fell victim to the evil persuasions of Satan and committed sin. But immediately after sinning, they repented their mistake, sought Allah’s forgiveness and were forgiven. It is important to point out that it was after they were forgiven and redeemed that they were sent down to the earth to play their role as vicegerents of Allah. They were promised Divine Guidance and were assured that those who followed the Guidance would be successful. Therefore, Adam was the first man to receive this guidance and convey it to this progeny, becoming the first prophet of Allah. Some important inferences follow from this. Islam does not contribute to any theory of the “fall of Adam” symbolizing the fall of man. Man was created for the purpose of acting as khalifah on the earth and he came to the world to fulfill this mission. It represents the rise of man to a new assignment, and not a fall. However, the concepts of khalifah and prophethood are not to be confused. The role and status of vicegerency is conferred upon the human being as such, and it is shared by man and woman alike. Islam subscribes to the view that human nature is pure and good. Man has been created in the best of forms and everyone is born in a state of purity and innocence. Furthermore, humans have been given freedom of choice. They are free to accept or deny the truth. Every person is responsible for his or her own actions, but is not deprived of this freedom, even if it is abused. The dangers of the misuse of freedom continue to confront humans as the challenge of Satan is unceasing. The trial of Adam and Eve reveals, on the one hand, the essential goodness of their nature and on the other, their susceptibility to error. It is to safeguard human beings against this that Allah has provided Divine Guidance through His prophets and messengers. There are three features of a prophet that can be recognized from surveying the various messengers throughout history. First, a prophet of Allah is the best in his community morally and intellectually. This is necessary because a prophet’s life serves as a model for his followers. His personality should attract people to accept his message rather than drive them away by his imperfect character. Second, Allah’s prophet is supported by miracles to prove that he is not an impostor. Those miracles are granted by the power and permission of Allah and are usually in the field in which his people excel and are recognized as superiors. Finally, every prophet states clearly that what he receives is from Allah for the well-being of mankind. He also confirms what was revealed before him and what may be revealed after him. So the message is one in essence and for the same purpose. Therefore, it should not deviate from what was revealed before him or what might come after him. The main content of the prophets’ message was to worship the One Allah as He wishes and to do good deeds in this life. Various details about Allah’s nature and laws would be elaborated upon depending on each individual case of the prophet. Islam emphatically rejects the concept of the “Divinity” of any of the prophets. They are essentially human beings and, although they are protected from sin, they can make minor mistakes. 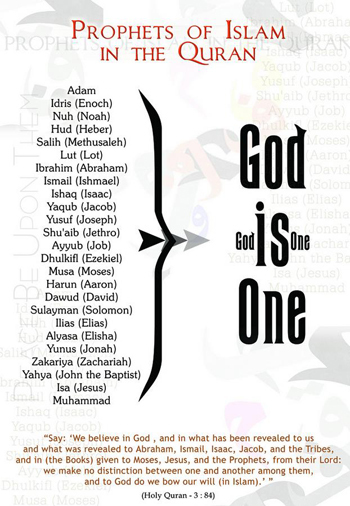 Although the Quran mentions only 25 names of prophets, Allah makes it clear that He has sent many prophets to humanity. There is no tribe or nation or race to which Allah has not sent His Guidance. The greatest prophets are Nuh (Noah), Ibrahim (Abraham), Musa (Moses), Isa (Jesus), and Muhammad (peace and blessings be upon them all). An outstanding aspect of the Islamic belief in prophethood is that Muslims believe in and respect all the messengers of Allah with no exceptions. Since all the prophets came from the same One God, for the same purpose – to lead mankind to Allah – belief in them all is essential and logical. The belief in all the prophets of Allah is an article of faith in Islam. Although Jews reject Jesus Christ and Muhammad, and Christians reject Muhammad, Muslims accept them all as messengers of Allah who brought guidance to mankind.